Not everywhere, but in Ireland it was Mother’s Day today. They day when thousands of mothers wake up to the smell of burned toast, cold coffee, and spilled orange juice. The day when you should avoid going out for a nice quiet meal with your loved one like the plague. We avoided the lunch hour rush and left it until the early evening (to avoid the evening rush) and still got caught between two tables of cocktail-drinking young mothers and a really loud band. Not that I would have any strong feelings about either of them, but both are to be avoided if you want to have a conversation. We made the best of it. It was fun, just in a very different unexpected way. Pádraig and An Saol made it into the Irish Independent (SIndo) today. 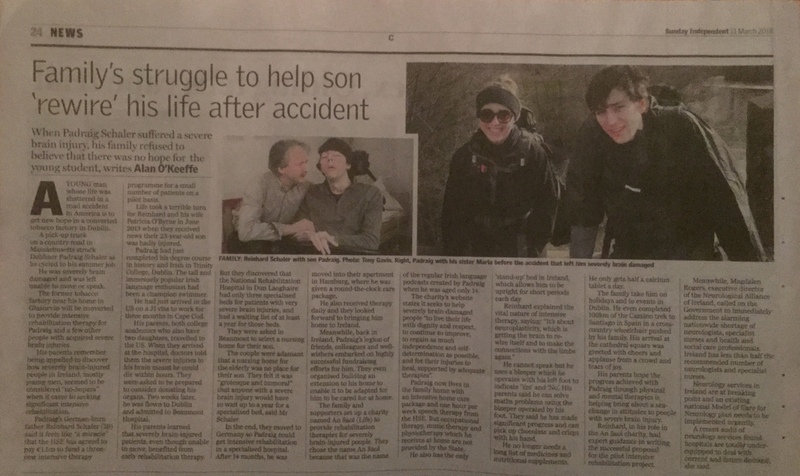 It’s interesting to compare the headline in the printed version (see above) and the one in the online version which reads: “Man (28) who suffered serious brain injury in ‘freak’ accident offered ‘miracle’ lifeline by HSE”. We also received an email from the photographer who came to the house with pictures that weren’t published. We woke up this morning not to the smell of burnt toast but the very sad news that one of Pádraig’s grandaunts had died during the night. I went to the hospital when I received the news. She had had a fulfilled life and had reached a very good age. But all that is, of course, relative. Although she had been ill and in hospital nobody had expected her to die. Her unexpected death really made me feel the fragility of life. We come and go, and there is no timetable for that journey. When I got back home, the streets were still empty and the day was just breaking. I decided to go for my first really long run (in preparation for the Hamburg marathon) – which I finished in a reasonable time but completely exhausted. If nothing else, it had cleared my head. Más que nunca besos y abrazos de todos nosotros!! !